WeSC is a Swedish street fashion brand with roots in the skate culture. The challenge was to create a digital solution that connects WeSC to new cultures like music and/or art. People upload a lot more photos then videos online because the process is too long and complicated. So how might we create a tool to lower the bar so that people can share and collaborate in the art of the video? 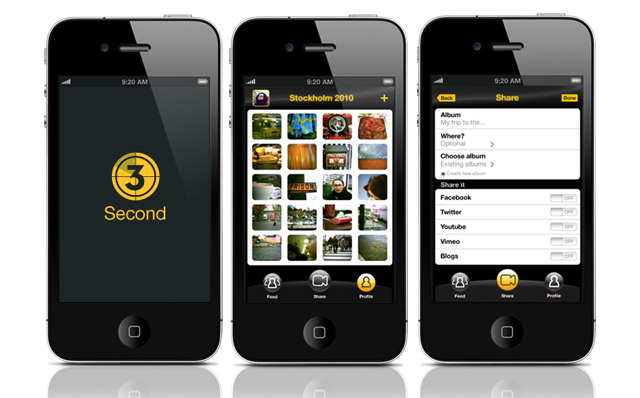 The “3 Second” application is a collaborative creative video tool that allows you and your friends to easily show the world what’s going on in your life in moving pictures. The application let’s you film for 3 seconds at the time, add a filter to you clip and put it in a folder where all your clips gets added to a timeline and showed as one movie. By sharing a folder with your friends you don’t have to try to collect everyone’s video material after a happening, because we all know that thats very unlikely to happen. We choose 3 seconds because it’s short enough to make anything you shoot look interesting. 3 seconds can inspire you to really be creative or to just shoot anything fun that happens around you.